You’re in the Bahamas for a very short time and we want to help you make the most of it. Below you’ll find the best beaches near Nassau Cruise Port. Whether you’re looking for a cheap and convenient beach option, or an all-inclusive & private beach getaway, we have you covered. Conveniently, there’s only one cruise ship terminal in Nassau. It’s called “Prince George Wharf” and it’s located on the northern side of the island. From there, it’s relatively easy to access every beach on the island. Nassau is one of the most popular (and highly trafficked) cruise ports on Earth. On popular days, up to seven cruise ships can be docked at one time. That’s roughly 20,000 passengers! Many will be heading to the beach. Don’t just blindly follow the crowds of passengers. By preparing in advance, you can find the ideal beach situation for you and your shipmates. ﻿ The rankings will vary wildly based on your personal preference. If you’re a family looking for convenience, you’ll have a much different set of priorities than newlyweds looking for privacy. We hope we have the perfect solution for every beach-goer below. We’d advise that you stick to one of our listed options. Some areas surrounding Nassau Cruise Port aren’t completely safe. It could be risky venturing off to a secluded beach. To avoid any safety concerns, these Nassau beaches are your best bet. 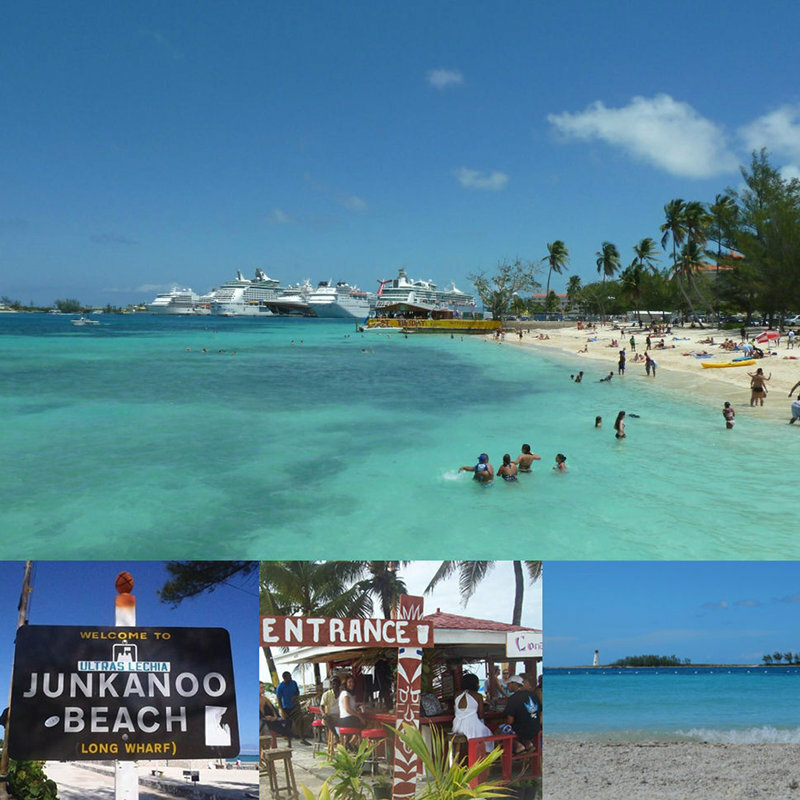 Junkanoo Beach gets the “closest to Nassau Cruise Port” award. If you’re looking for an easy solution, this is your beach. It’s definitely not the nicest beach in the Bahamas, but great to pass the time between other excursions. Many cruisers stop by for an hour or two after shopping, dining, or participating in an organized tour. It has absolutely everything you need to pop in, enjoy the beach, and make your way back to the ship. Very little preparation or thought is needed to enjoy this beach option. Junkanoo Beach is very close to Nassau’s Cruise Port (Prince George Wharf) and within walking distance to your ship. After disembarking, take an immediate right (west) and you’ll arrive at the beach in roughly 15 minutes. Street access is a bit dicey as the roads are fairly narrow with heavy traffic and quickly moving vehicles. Just be mindful of cars and it shouldn’t be a problem. If concerned, a three-minute cab ride is also an option. Some visitors would argue that the beach is too close to the cruise port. While relaxing in the sand, the docked cruise ships will be in your vista background. To some that can be a comforting sight. Others would prefer to get some distance. Nassau’s Junkanoo Beach is free to access. If you’re planning to use a beach chair, grab some food, or borrow some water-sports equipment, there will be an associated charge. 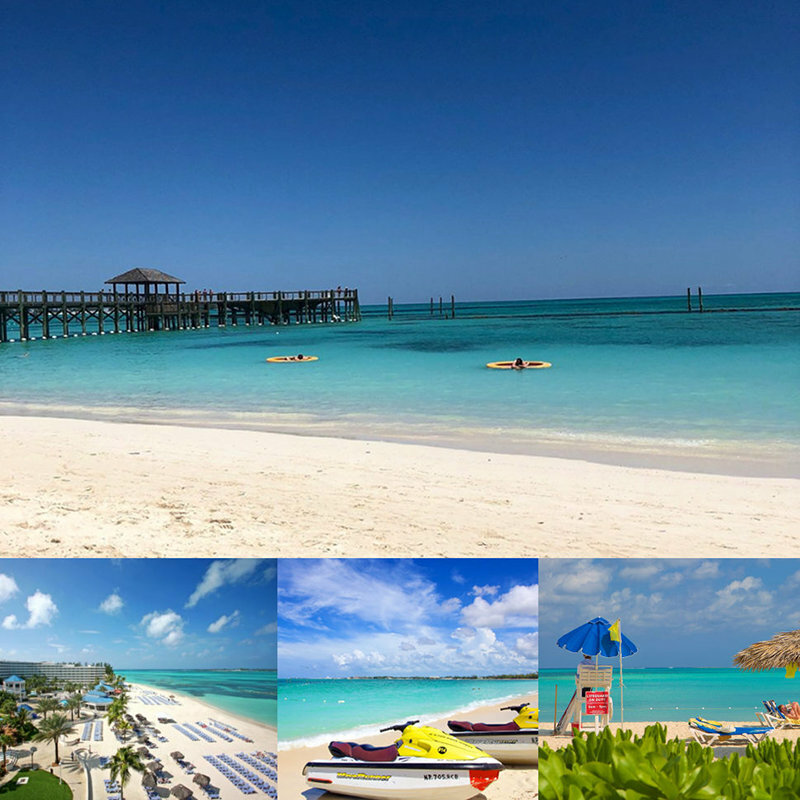 Hilton Nassau All-Inclusive Day Pass: If you’re looking for a beach as close to Nassau Cruise Port as possible while ALSO avoiding crowds and solicitors, there’s another option we’d suggest. Next to Junkanoo Beach is a private section of the coast operated by the Hilton Resort Day Pass. For $82 you’ll get private beach access, cleaner chairs & umbrellas, pool & cabana access, and $40 in food and drink credit. This truly is the most convenient way to experience Nassau beaches. If you’re planning to rent chairs and have a bite to eat, this upgraded option could make sense. You’ll find multiple convenient options to grab a bite or a cocktail right on Junkanoo Beach. The famous “Tiki Hut” is situated right on the beach and serves up local favorites like conch hot dogs, fried fish, and ceviche. Also, make sure to check out the drink specials. Our favorite is the “four beers and four shots” for $10 deal. That’s a total of eight drinks for the same price as one cocktail at Senor Frogs or Fat Tuesdays! On Junkanoo Beach, everything you’ll need is within a frisbee throw of your beach chair. If you don’t have a beach chair, you can rent one (and an umbrella) for $10. Also for rent, you’ll find snorkels and other water-sports equipment to frolic in the crystal clear waters. Vendors walk the beach soliciting their wares, but in a relatively unobtrusive way. You won’t get hounded as found in other areas. If interested, you can get your hair braided (Bahamanian style) or get a massage on the beach. Last we checked, a sunrise rub-down was only $25 for twenty minutes. Once you’re done with your beach day, you’ll find showers available to get rid of that sand or massage oil. There are also bathrooms available, which will be a necessity after that $10, eight-drink deal mentioned earlier. Please note that the attendants looking after the shower and bathroom facilities will expect a tip. It’s not required, but it’ll likely get awkward if there’s no money exchanged. To get a more substantial meal or frozen drink options, you’ll find Fat Tuesdays and Senor Frogs two minutes from Junkanoo Beach. Also nearby is the Straw Market, a great place to pick up souvenirs for the kiddos back home. 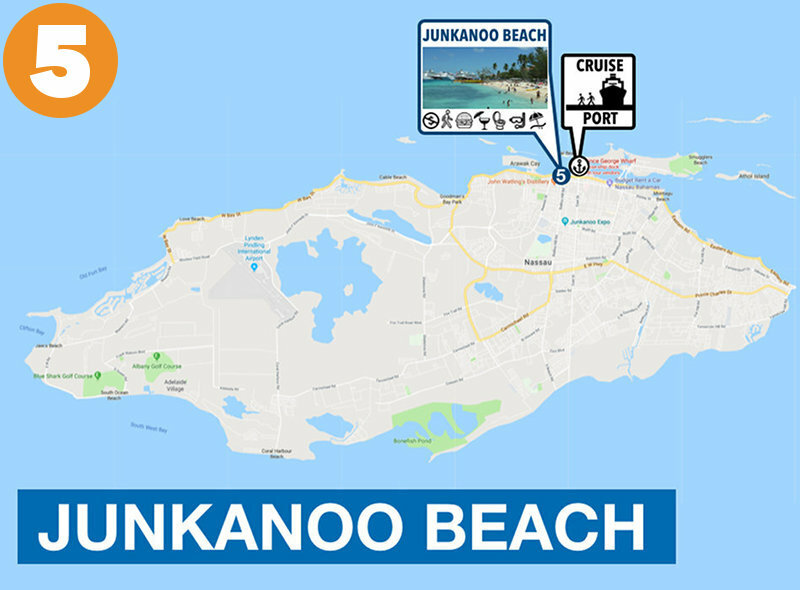 In terms of convenience, the amenities at Junkanoo Beach beat out all of our other recommended beaches near Nassau Cruise Port. Junkanoo Beach wins for “convenience,” but not for “quality.” While the water is crystal clear, the sand isn’t the most ideal. You’ll find a rockier mixture than at other beaches near Nassau Cruise Port. It’s also common to find sea-glass mixed in with the sand. Some cruisers enjoy the more natural look versus a superficial bleached sand. We’ll let you decide. The size of Junkanoo is smaller when compared to other options. You won’t find as many people here as some of the more popular beaches, which is good because it couldn’t fit a large crowd. Also to be desired is a prettier view from Junkanoo Beach. With the shipping docks and cruise terminals in the peripheral, the vista could be a tad more natural. You’ll also find the immediately surrounding area to be more commercial and trafficked than a other beaches. Cabbage Beach is very popular with cruisers and easily earns a spot in our best beaches near Nassau Cruise Port. Without a little help, it can be tricky to locate. We’re here to show you the secret entrance and to provide all of the other info to choose whether this is the beach for you. Cabbage Beach is located on Paradise Island just over the bridge from your Nassau Cruise Port. While it’s possible to walk there, it would take close to an hour to get there on foot. Instead, jump in a cab and for $4 per person you’ll be there in 10-15 minutes. The entrance to Cabbage Beach is easily missed as it’s an inconspicuous dirt road with no obvious signage. 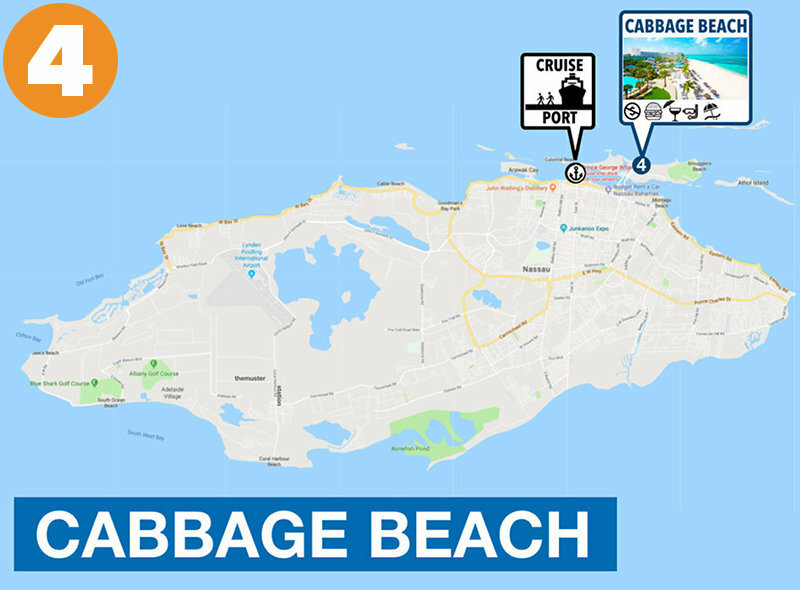 If coming by taxi, your cab driver should know where to drop you for “public access to Cabbage Beach.” Otherwise, you’ll find the dirt access road just east of the RIU hotel on Casino Drive. The walk up the hill can be a bit taxing to those with physical issues. From your ship, there’s one more option to get to Cabbage Beach. A water taxi service picks up near your cruise terminal and can drop you off on Paradise Island. We’d advise against this. It takes significantly longer than a normal cab and you’ll have a ways to walk once dropped off. Trust us – don’w waste that valuable beach time. Take a taxi to Cabbage Beach. Nassau’s Cabbage Beach is free to access. If you’re planning to use a beach chair, grab some food, or borrow some water-sports equipment, there will be an associated charge. When entering the public access road to Cabbage Beach, expect lots of solicitation from local vendors. It can get aggressive so hold your ground. For a beach chair and umbrella, they’ll expect between $15 and $25. Bartering is definitely an option. Here’s a couple options If you’re worried about fighting crowds, bartering for beach-chairs, lacking amenities, etc. You’re able to purchase a “resort day pass” that gets you access to the amenities that are typically only open to guests. Warwick All-Inclusive Day Pass: Your Warwick Resort Day Pass includes all food and beverages (including alcohol). Make sure to try one of their frozen cocktail specials from the “Hog Bar.” Lounge around in their 330,000 gallon free-form pool, or snorkel in the sheltered lagoon. Help yourself to the chairs, umbrellas, and water-sports equipment. All are included with your resort access pass. For details and pricing, click here. Atlantis Aquaventure & Dolphin Cay: The world renowned Atlantis Resort is located on Paradise Island just next to Cabbage Beach. The resort costs guests hundreds of dollars per night and includes access to the amazing attractions. Fortunately, you don’t need to be a hotel guest for this same access. There are multiple options to take advantage of the private Atlantis Beach, the Aquaventure theme park, or Dolphin Cay. These range in price from $49 to $289. For exact costs and details click here. Vendors constantly patrol the beach selling food and drink. One popular option for those drinking alcohol is the “all you can drink” offering. For $20, locals will refill your coconut or pineapple (your choice) with their pre-mixed specialty. For a more complete meal, you can head to the Atlantis. They have super high-end restaurants (like Nobu) as well as faster (and cheaper) options. To save a few bucks, bring bottles of water and snacks from your cruise ship. We always pack our collapsible beach tote bag when we cruise. It holds tons of food and water, then folds up into your back pocket when done. One downfall of Cabbage Beach is that it lacks restrooms and showers. The closest bathroom facilities are found in the nearby RIU and Atlantis resorts. If planning to use these amenities, you’ll need to be a guest of the hotel. Many cruisers purchase a Day Pass for this purpose (see above for details). That provides access to many amenities, not just restrooms. Chairs and umbrellas are available and heavily pushed by local vendors. On the path to Cabbage Beach, you’ll have many people offering both for between $15 to $25. It’ll depend on supply and demand for that day. Obviously shoot for $15 for both. Other services offered include foot massages ($30 for 30 minutes), hair braids, bracelets, and more. Water-sporting equipment is readily available as well on Cabbage Beach. You’ll find jet-skis, parasailing, banana-boating and more for a fee. Cabbage Beach offers beautiful, white-sand beaches and crystal clear waters. The views are spectacular as you face north towards the Caribbean. Many visitors warn others of the dangerous surf. Along with big waves, a strong current should be expected. Swimming conditions aren’t ideal for younger children or adults without very strong swimming skills. Some cruisers complain of litter in the main section of Cabbage Beach. Recently, the RIU resort was built and now abuts the main section of the beach. During the busy season, we’ve heard reports of garbage piling up from the resort and cruise passengers. If the section of Cabbage Beach you find isn’t idea, feel free to walk east or west. You’ll find the Atlantis Resort and beach to your west and more secluded areas towards the east. Most cruise passengers will stay in the main area. Those looking for less crowds can venture one way or the other. Supposedly there are some truly amazing hidden gems found by walking a mile or two east. 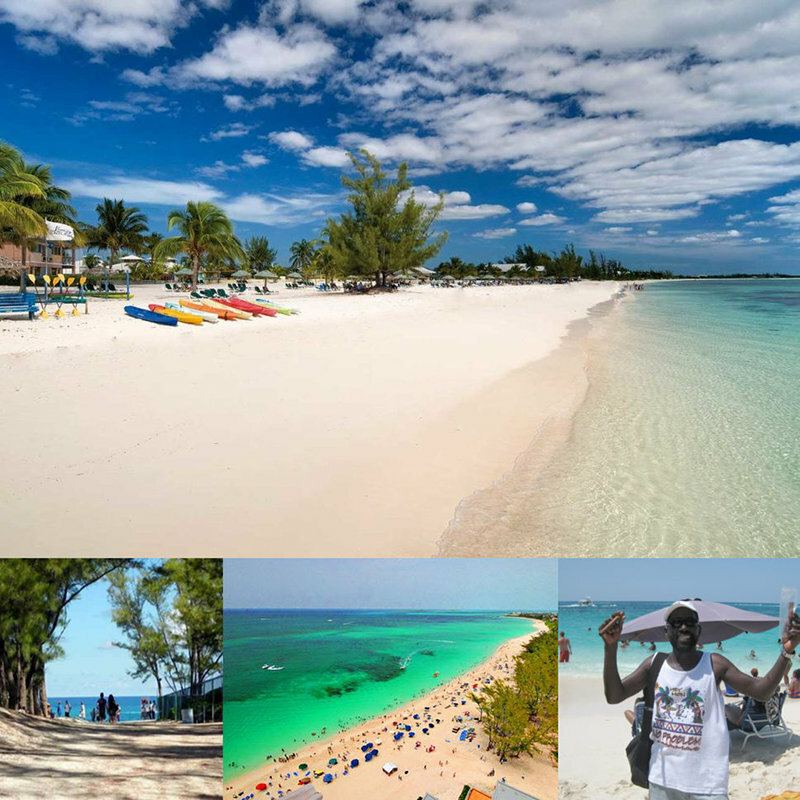 Cable Beach is one of two extremely popular beaches near Nassau Cruise Port. You’ll often find cruise ship employees heading here to enjoy their day off. 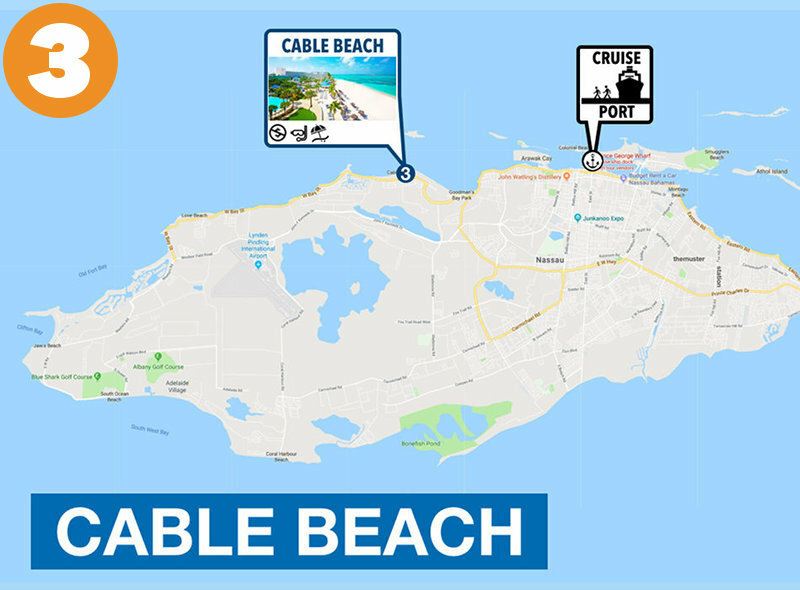 There are two public beach areas of Cable Beach among this strip of resorts. Both make for an amazing day in the Bahamas. Cable Beach is located on the main-land (Providence Island) roughly six miles west of Nassau Cruise Port. From your terminal (Prince George’s Wharf) you can hop in a taxi and get there in 20 minutes. It’s a scenic route along the northern coast of Nassau that will cost you $6 per person. Cable Beach is a long stretch of sand made up mostly of private beach areas. These are managed by the surrounding resorts and access is restricted without wristbands. There are only two access points for public access to Cable Beach. The first is easy to miss as there aren’t any signs. It’s right by Maharaja Restaurant next to the Melia Resort. The second public access point is just off the roundabout by Starbucks. If you’re coming from Nassau Port, you’ll be heading west. When you see Starbucks on the left-hand side, you’ll want to take your first exit on the right. Cable Beach is a couple hundred yards up that road. 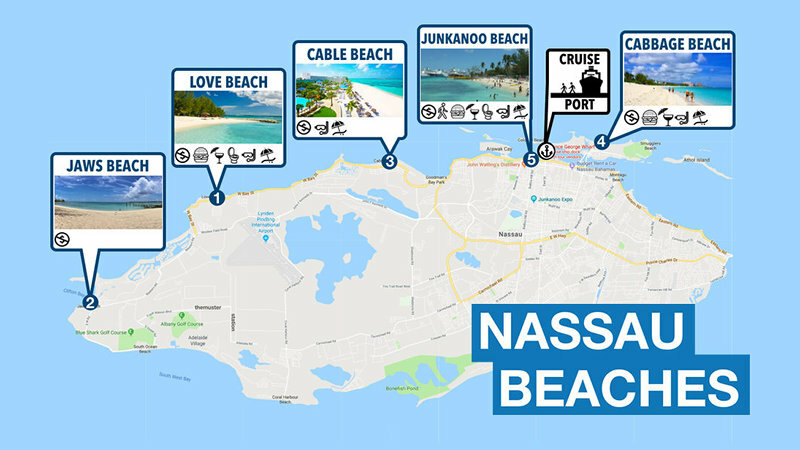 If pinching pennies, you can take public transportation from Downtown Nassau to Cable Beach. For $1.25, the #10 bus will drop you off right there at the access road. Make sure to tell your bus driver where you’re headed just for assurance. Nassau’s Cable Beach is free to access. If you’re planning to use a beach chair, grab some food, or borrow some water-sports equipment, there will be an associated charge. You can expect vendors to solicit business while you’re trying to relax in the sand. They aren’t quite as aggressive as on Cabbage Beach, but still there. For a beach chair and umbrella, they’ll expect between $10 and $20. Bartering is common in the Bahamas. Breezes All-Inclusive Day Pass: Cable Beach has an “All-inclusive Resort” option for those worried about fighting crowds, bartering for beach-chairs, lacking bathrooms, etc. You’re able to purchase a “resort day pass” that gets you access to the amenities that are typically available to guests. Breezes Resort has multiple fresh-water pools, swim-up bars, jacuzzis, and much, much more. Food and drink (even alcohol) are included in your Breezes Resort Day Pass. Enjoy the beauty of Cable Beach with the conveniences of a resort. See more details here. There aren’t many options for food and drink on Cable Beach. Most visitors are staying at one of the surrounding resorts and have access to the associated bars and restaurants. The resorts will typically require that you’re a guest to use their facilities. If you walk up to W Bay Street, you’ll find restaurants, markets, Starbucks and other options. But, this isn’t a convenient walk. To save a few bucks and lots of time, bring bottles of water and snacks from your cruise ship. We always pack our collapsible beach tote bag when we cruise. It holds tons of food and water, then folds up into your back pocket when done. Unfortunately, Cable Beach has no convenient restrooms or showers. The closest bathroom facilities are found in the neighboring resorts. But, typically these can’t be accessed without being a guest or paying for a Day Pass (see upgraded option above). Chairs and umbrellas are available from local vendors. It will depend on the crowd, but you can typically score both for $20 or less per set. Water-sporting equipment is readily available on Cable Beach. You’ll find jet-skis, parasailing, banana-boating and more. You can’t miss the vendors peddling these services to resort and cruise visitors. Cable Beach offers beautiful, white-sand beaches and crystal clear waters. You’re far enough west to get beautiful views without an obstructed view from the cruise ships or Paradise Island. Off the shore of Cable Beach, a reef runs parallel to the island. This makes for great for swimming, snorkeling, and other water-sports. Waves are broken up before they can get close to shore. As a result, the waters are calmer and much safer than found at other beaches near Nassau Cruise Port. It’s also shallow. So, all water-activities are more manageable. Due to the protection provided by the reef, Cable Beach is great for viewing marine life. It’s common to find sea turtles, stingrays, and even lobsters. Bring your snorkeling gear or rent some gear from vendors on the beach. Jaws Beach wins the award for “most interesting” of all the beaches near Nassau Cruise Port.” You might just recognize it from (no surprise here) Jaws III. Or, if you walk down the beach a bit, you’ll find the backdrop used in the movie, Flipper. And, sunken underwater you’ll even find a submerged plane used in a James Bond film. It’s not only popular with movie buffs, but also with snorkeling and scuba diving enthusiasts. Off-shore a bit, you’ll find some of the most interesting underwater artifacts. In addition to the plane mentioned, there’s “Ocean Atlas.” It contains the largest, underwater sculpture in the world! It measures 60 tons and stands over 5 meters off the ocean floor. We’d recommend Jaws Beach for the more active and adventurous types looking to escape the crowds. It’s the most secluded of our recommended beaches near Nassau Cruise Port. Getting there is a tad less convenient, so families might want to consider another option. 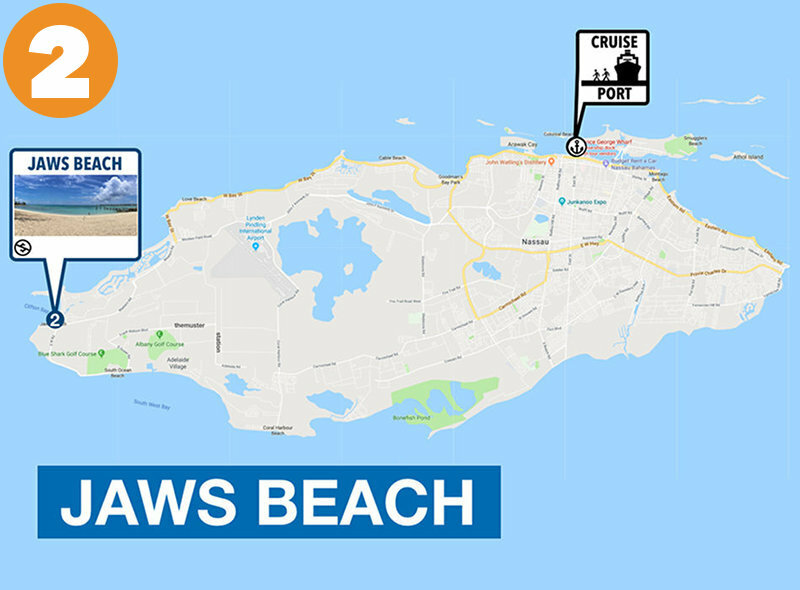 Jaws Beach is the furthest from Prince George Wharf of all of our recommended beaches Near Nassau Cruise Port. To call it “near” might even be a stretch. It’s situated on the west coast of New Providence Island. You’ll need to take a taxi there and it’ll take roughly 30 minutes and possibly longer with traffic. Expect to pay around $35 each way. You may want to schedule a pick-up from the cab driver taking you out to Jaws Beach. If negotiating a round-trip fare, you can likely save a bit on this taxi fare. It’s a bit off-the-beaten-path so make sure to give yourself a cushion to get back to your ship. From S W Road, you’ll take White Road up to the public beach access area. Your cab driver should know the exact location to drop you off. Additionally, the bus is an option for cruisers looking to save a few bucks. The #12b “Jitney” bus costs only $1.25 and will get you there. Make sure to double-check with your driver that Jaws Beach is on your itinerary. Sometimes they’ll skip this stop, so this part is important! Directly connected to Jaws Beach you’ll find Clifton Heritage Park. You can access this area by walking just west. Some cruisers have reported paying $10 to explore this area while others said it was free if accessed from the beach. Jaws Beach is free to access. You’ll find few, if any, vendors selling services and renting equipment. Prepare to be one of the only people on Jaws Beach if there during a weekday or slow cruise time. Adjacent to the beach you’ll find Clifton Heritage Park. The admission fee for the park is $10, but some cruisers reported free beach access when accessed from Jaws Beach. You won’t find vendors offering food and drinks here as seen with other beaches near Nassau Cruise Port. It’s likely you’ll be one of very few visitors to Jaws Beach. We always recommend that you bring bottles of water and snacks from your cruise ship. We always pack our collapsible beach tote bag when we cruise. It holds tons of food and water, then folds up into your back pocket when done. People love and hate Jaws Beach for its lack of amenities. You won’t find vendors, restrooms, showers, lifeguards, or any of the standard services provided at other popular beaches. This is great for those looking to escape the crowds and over-developed beaches. But, it’s a pain for families or those looking for more convenience. However, you will find picnic tables and plenty of shaded areas, so umbrellas aren’t necessary. We’d recommend that you bring a towel or blanket if planing to get some sun. Also, bring your own snorkeling gear to experience the amazing underwater sculptures and sunken Hollywood memorabilia mentioned above. Clifton Heritage Park is next to Jaws Beach. There, you’ll find a small gift shop and public restrooms. Although there’s a $10 admission fee to access the park. Jaws Beach offers amazing waters, perfect for snorkeling. You’ll find that Jaws Beach is within a protected cove, so expect much calmer waters than other beaches near Nassau Cruise Port. There are also tide pools to explore. 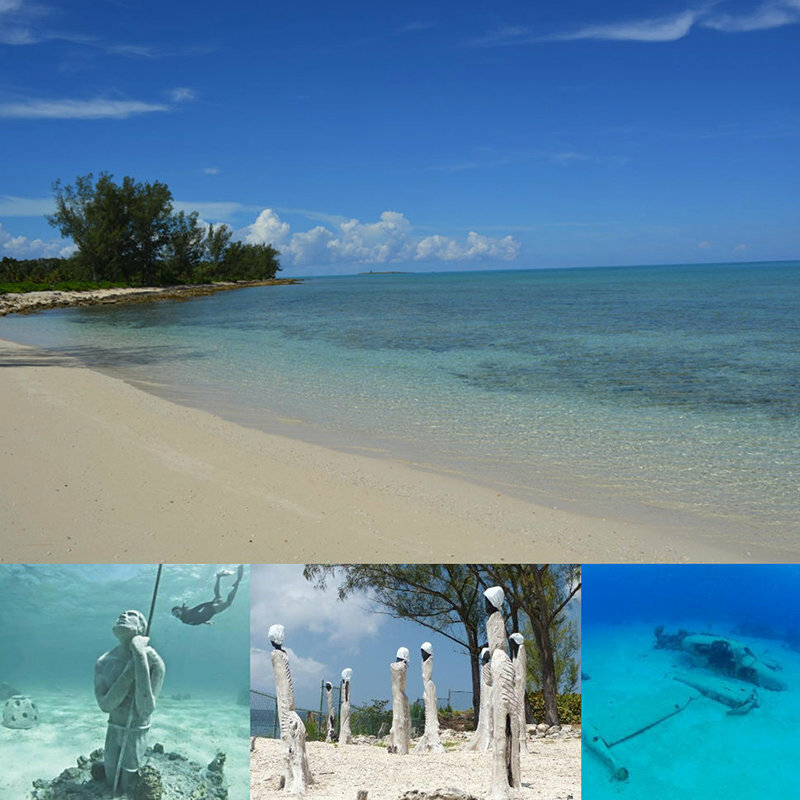 Snorklers and scuba divers will find the underwater sculptures and artifacts mentioned above along with an abundance of marine life. Stingrays, turtles, and lobsters are regular visitors to the waters off of Jaws Beach. The sand is a bit gritty with sparse sea-glass and shells. Some visitors have reported trash strewn about, but others found it to be spotless. If you find Jaws Beach to be less than idea, you have two immediate options. Flipper Beach is 1/2 mile walk away and Johnston Beach (within Clifton Heritage Park) just next door as well. Love Beach wins the award for “most secluded” of our recommended beaches near Nassau Cruise Port. Some might even consider it a “secret Nassau beach” and get upset with us for sharing this secret. In addition to privacy, it includes all of the amenities and conveniences you’ll need for an amazing Bahamas beach day. 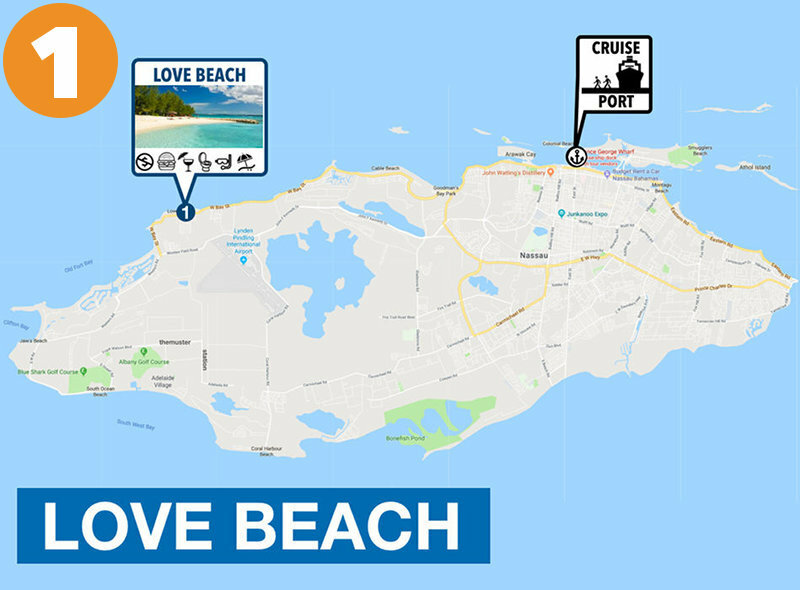 Love Beach is the second furthest from Prince George Wharf of all of our recommended beaches Near Nassau Cruise Port. The taxi ride along the northern stretch of New Providence Island will take roughly 20 minutes or more with traffic. Expect to pay roughly $30 each way. If you negotiate a round-trip fare, you can save a few bucks. We’ve had cruisers report paying $45 in total. For those looking for a cheap beach day, the local bus is an option. Take the #12 or the #12b “Jitney” bus from the corner of George and Bay St. It’ll cost roughly $2.50 per person for the round trip. Make sure to tell your bus driver where you’re headed. Also, take a business card from your driver to call when you’re ready to leave. Love Beach is free to access. You’ll find very cheap rental rates for snorkels, chairs, umbrellas and more from the Nirvana Beach Bar on site. You won’t find vendors here harassing you as with other beaches near Nassau Cruise Port. Everything that you need will be up at the Beach Bar and provided by very polite and inviting hosts. You won’t find vendors here as with other Bahamas beaches. You will, however, find a really convenient beach bar with delicious food, drinks, equipment rentals, and more. Food served at the Nirvana Beach Bar is spectacular with favorites including the conch salad and fried snapper. Drinks are also available and amazing. Try the Pina Colada. Prices on food and drink are on the high end. It was reported by one cruiser that this is done intentionally to keep out the “riffraff.” Whether that’s true or not, is unknown. While food at the beach bar is a bit higher than normal, rental rates on amenities are significantly less than expected. Snorkeling gear is available for just $5 an hour. Beach mats for $2 per hour. And Chairs for just $3 for the day. You’ll also find clean restrooms and shower facilities up by the Nirvana Beach Bar. And to show you’ve been there, take home a souvenir from the cute little shop. There are a few nuances to Love Beach that make it very unique and interesting. For one, you’ll find that planes are flying overhead on a regular basis. Depending on the day, this could be more or less frequent. Some visitors love this about the beach while others find it annoying. Conch shells are abundant at Love Beach. You’ll even find an entire conch shell wall lining the beach. Calmer waters make swimming and snorkeling a great option at this beach. A reef wall just off shore provides protection from the waves and also a haven for small fish, turtles, and other marine life. At Love Beach’s main area, the entrance into the water is a bit rocky. If planning to go in and out of the water frequently, you might want to walk a bit down the beach where access is smoother. There are also tide pools along the coast. These make for great kiddie-pools and also known to trap fish for your underwater viewing pleasure. For more great cruise port beach guides, check out the posts below. If we missed any of your favorite beaches near Nassau Cruise Port, please let us know in the comments below! Also, if you have anything to add about the options mentioned above, please speak up. Thank you so much. So well done and useful. Glad to hear that, Hugh! 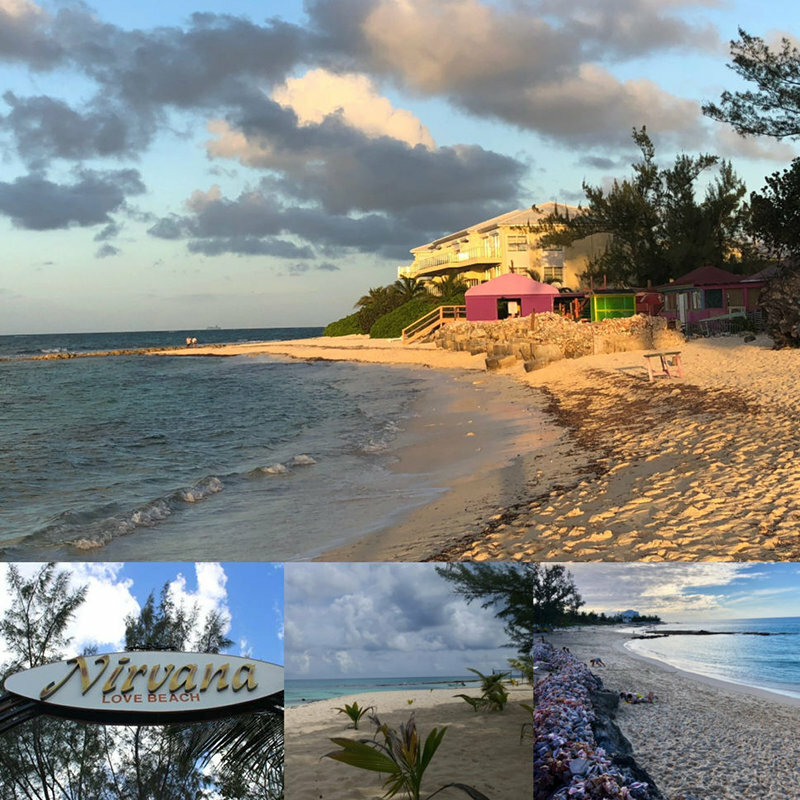 If you visit a Nassau Beach, make sure to let us know how you liked it. Happy cruising! Enjoyed a nice day at uncrowned Love Beach. The number 12 bus departs from a stop in front of the McDonalds. We were told the bus #10 was quicker and took that bus. We returned on the #12 bus.